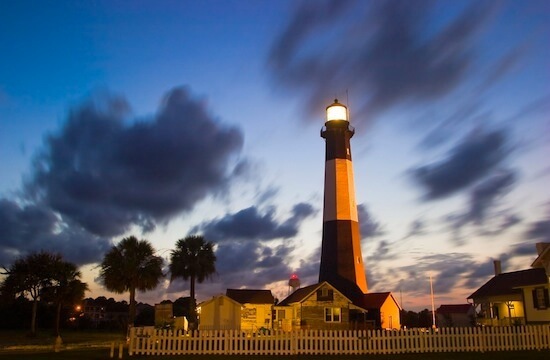 Start in Charleston and cruise down the coastline of South Carolina, Georgia and Florida. Highlights include charming Charleston along with sultry Savannah, America’s oldest town St Augustine, chilled out Key West and South Beach, Miami. Fly direct to Charleston with British Airways on their new route! The team at The American Road Trip Company adore this city, in fact we think it’s one of the best places to visit in America. Plenty of people agree, Charleston has been voted the best ‘small US city’ for eight years running. British Airways have direct flights operating from London Heathrow making this a really easy destination to start your stateside road trip adventure from. Steeped in Colonial and Civil War history, Charleston is a perfectly preserved and friendly southern belle of a city. Visitors fall in love with its grace, charm and historic value which is usually enjoyed in the warmth of the South Carolina climate. Cobblestone streets, colourful houses and historical buildings make it a unique city. Explore more of Charleston or its coastline. Spend a full day discovering the history and architecture of Charleston. The city is in a mini renaissance at the moment, attracting new restaurants and culture into the mix. As always, your personalised Road Trip Pack will detail all the visitor options that are available, such as Magnolia Plantation, Charleston City Market and so much more. After spending three nights & two memorable days in this beautiful city, Charleston will stay with you for many a year. Cruise down to Savannah in the morning, exploring beautiful beaches like Hilton Head and Tybee Island as you make the short drive south. Be sure to work up an appetite en route, Savannah is home to many great BBQ restaurants and the famous Leopold's Ice Cream Parlor. Such a charming and friendly city be sure to check out the riverfront area for bars, restaurants and riverboat cruises. Your personalised road trip pack has plenty of suggestions. Over 2 square miles of lovingly restored colonial houses and commercial property expertly arranged around 21 of Savannah’s 1-acre squares. A great city to walk around in the warm sun found here. Look out for Forrest Gump whilst you walk, he likes chatting to people on the park benches here. Which will be your favourite southern belle city? Charleston or Savannah? Let us know when you get home, it’s a very close vote at the moment! Highway 17 in the very south of Georgia is one of the states most scenic roads, follow it to the Sunshine State of Florida. Take the day to experience some of the pristine beaches found along the way, these include Driftwood Beach, Amelia Island and St. Augustine, the oldest city in the US. Continue on to Orlando or we can arrange an overnight instead at one of these Atlantic coast beach towns. Wow Orlando - The theme park capital of the world! The parks are continually evolving and Orlando is a mecca for theme park enthusiasts. Make sure you check out the "big two" of Walt Disney World and Universal Orlando, a whole world of fun. Another day to explore the theme parks, water parks, golf courses or swimming pools of sunny Orlando. If you plan to enjoy the parks, be sure to ask us about how to maximise your experience by avoiding the lines. The parks are HUGE, Disney World is twice the size of Manhattan! Cape Canaveral or swanky Palm Beach, both please! Cruise south to Palm Beach. As you reach the Atlantic coast once more you’ll pass the home of the Kennedy Space Center and the launch pad for many a space mission. Over 60 years of space exploration history can be seen in Cape Canaveral, including 8 rockets, an IMAX 3-D theatre and even a G-Force simulator. Alternatively, motor sport fans may prefer to check out Daytona International Speedway en route to swanky Palm Beach. If neither appeal, then just eat up the miles on the I-95 to get poolside in under 4 hours. The drive from Palm Beach to Key West, at the southwest tip of the Florida Keys, takes you along a string of small islands linked by a road set on stilts called The Overseas Highway. Once a refuge for presidents and writers, the Keys now serve tourists and free roaming chickens. Once at Key West, spend the evening at Sloppy Joe’s on Duval Street and soak up the laid back atmosphere, your at the southern most point of America and as close to the Caribbean as you can get. Diving enthusiasts should consider the options to get wet whilst on The Keys, America’s best diving is found here. Whilst literary fans may want to visit the Ernest Hemingway Home and Museum. Alternatively, you can just find a beach or relax by the hotel pool. Cruise back up the 100 mile “Overseas Highway” all the way back to mainland Florida, you’ll then circle Biscayne Bay on your way to Miami Beach. As an optional 90 mile detour, you can opt to explore the Everglades National Park en route too. Once you arrive in Miami Beach you’ll find miles of sandy beaches, backed with glitzy Art Deco hotels and sprinkled with attractive residents going to and from model castings. Walk the boardwalk or enjoy a meal while you people watch. Forget Miami Vice, this area is classy and the hotels are amongst Americas best. Enjoy your first full day in Miami. We recommend exploring one of the many characterful neighbourhoods to really get a feel for the city. Little Havana is particularly distinctive and is home to the largest Cuban community outside of Cuba itself. We also recommend checking out The Wynwood Walls art district with colourful murals in a thriving neighbourhood. Alternatively, you may want to take a refreshing visit to the 1920s built Venetian Pool in Coral Gables to enjoy this a beautifully landscaped water feature. Pool or Beach? Hmmm - it’s tough call, why not do both? Spend the last day and half relaxing by the hotel pool or chilling on the beach, check out the cool life guard huts that watch over the Atlantic coastline. Before you leave Miami tomorrow, make sure you’ve tasted some of the great nightlife the city offers. Don't forget to check out this road trip's Itinerary tab to see more amazing pictures from our "Atlantic Explorer" tour. You'll also be able to read a little bit about what you'll be getting up to on each and every day of this incredible holiday adventure.